Adorable Tiny Princess Tales™ design of the musical Soothe 'n Groove Mobile™. Melodies to grow with! Selection of 18 melodies in 6 musical categories, resulting in 40 mins of continuous non-repetitive music, amuses and soothes baby while supporting the development of EQ. 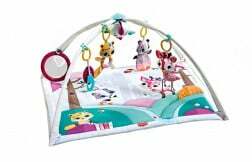 This adorable Tiny Princess Tales™ mobile features our cute Tiny Pioneers and uses Jazz, World, Nature sounds, Classic, Lullaby or soothing White Noise music to encourage cognition and communication. 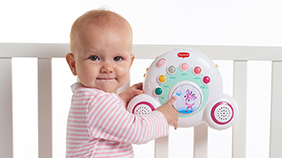 The high-quality speakers and shuffle button keep the playlist fresh, offering pure enjoyment for babies and parents. Part of the Tiny Princess Tales™ Collection. Development has never looked so adorable! 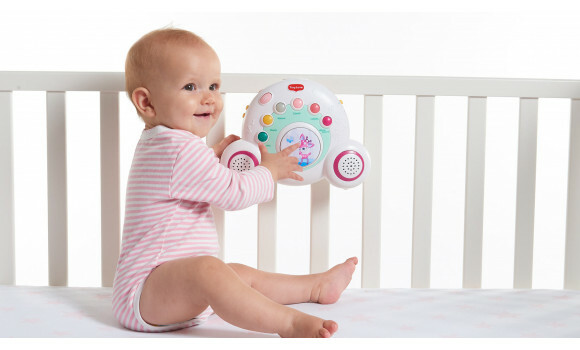 Let baby enjoy the fun musical selection while in the crib or play the unique White Noise option to your newborn baby. Research has found that White Noise relaxes newborns as it reminds them of the sounds they had heard while in the womb. Once the time for mobiles is over, remove the arm and leave the stand-alone music box. 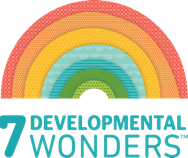 Soon enough, your baby will learn how to activate the music box independently and revel in that discovery. 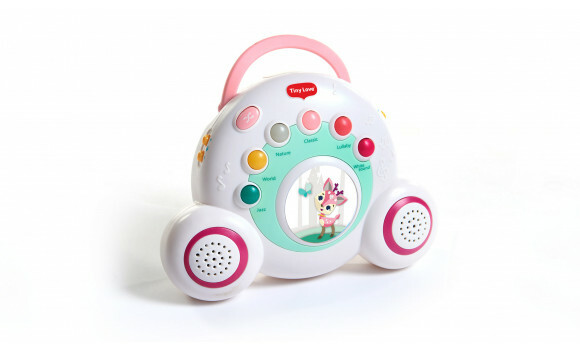 Once your little one starts walking, he or she will enjoy carrying the portable music box around and listening to their favorite tune from the extensive musical selection. 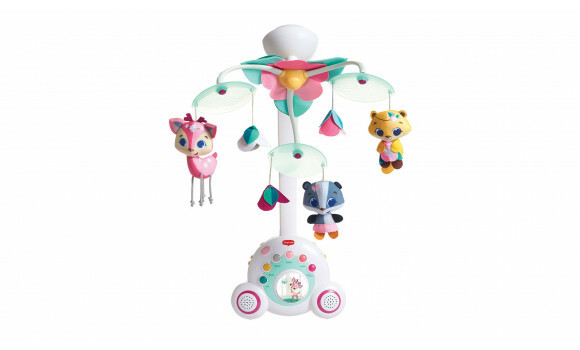 Enjoy as a classic baby mobile with added musical value and variety. Remove the mobile arm and leave the music box only once baby is sitting up. The mobile’s cute Tiny Princess Tales™ characters appear and disappear above baby’s head. This creates a sort of peek-a-boo game that helps baby grasp the idea of object permanence. As baby grows and begins to press the music box’s various buttons, your little one learns about the wonders of cause (pressing a button) and effect (music and lights). As babies lie in their crib or bed, cooing at the mobile characters, smiling and practicing some baby talk, they hone their communication and language skills. The smiling characters’ large eyes and the mobile’s slow motion along with the diverse musical selection stimulate baby’s sense of sight and sound. The soothing music and steady movement create an atmosphere that calms babies and helps them through the process of going to sleep.